Coffee Cake. Mrs. Matson. No.1. 1 cup sugar 2 cups flour 1/2 cup butter 1/2 cup molasses 1/2 cup strong coffee 2 eggs 1 teaspoon cloves, mace & cinnamon each, mix all together add flour last. Sponge Cake. Mrs. Kimball. No.1. 16 eggs - whites beaten to a froth 3 tumblers powdered white sugar 2 & 1/2 tumblers sifted flour - 3 tea spoon cream tartar well mixed through the flour 1 & 1/2 tea spoon soda dissolved in 2 tea spoon milk. 1 tea spoon essence of lemon. Susan's Sponge Cake. No. 2. 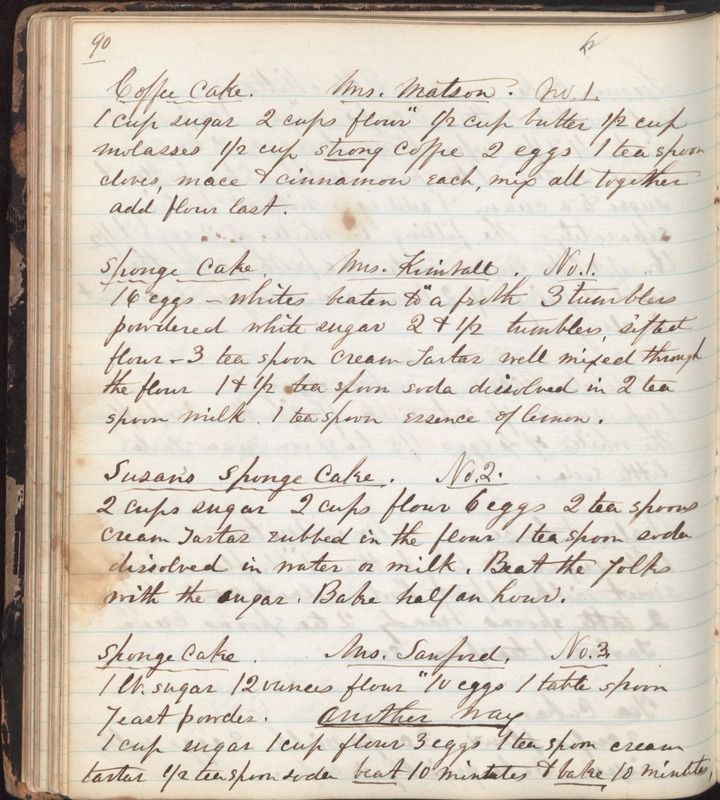 2 cups sugar 2 cups flour 6 eggs 2 tea spoons cream tartar rubbed in the flour 1 tea spoon soda dissolved in water or milk. Beat the yolks with the sugar. Bake half an hour. Sponge Cake. Ms. Sanford. No. 3. 1 lb. sugar 12 ounces flour 10 eggs 1 table spoon yeast powder. Another way 1 cup sugar 1 cup flour 3 eggs 1 tea spoon cream tartar 1/2 tea spoon soda beat 10 minutes & bake 10 minutes.